At least four ticks were attached to the head of this Purple Finch (Carpodcus purpureus) captured for banding at Hilton Pond Center. As a naturalist, I've often thought about how tough survival must be for wild birds and other animals that never get to visit the veterinarian. It might be impossible to prove, but I'll bet more wild animals die from disease and parasites than from all other causes combined. I've examined lots of road-killed raccoons, foxes, and 'possums, and I almost always see fleas in their pelts; since I often make study skins from these specimens, I find worms in their internal organs. With mammals having such high parasite loads, it shouldn't be a surprise to learn that birds also have their complement of external and internal "guests." Endoparasites--those that live inside birds--are either microscopic (such as bacteria) or visible to the naked eye (such as roundworms and tapeworms). Birds also carry ectoparasites--external hitchhikers that can be more or less benign. 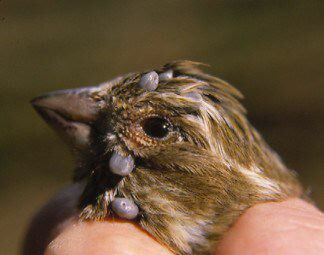 These include microscopic feather mites or flat little hippoboscid flies that bite, but the most visible and damaging ectoparasites on birds are ticks. At my bird banding station in South Carolina, I'm amazed by the number of birds infested with these blood-sucking, eight-legged pests. Since 1982, I've banded birds at Hilton Pond near York, SC, and through mid-April of this year I've handled 17,018 individuals from 110 species. During my first 18 months of banding, I detected no large ectoparasites on the first 1,700 birds, but in the winter of 1983-84 I found ticks on the heads of three Purple Finches, two Dark-eyed Juncos, a Field Sparrow, and a Carolina Wren. I was curious about this, but seven parasitized individuals out of another 2,000 birds didn't strike me as a major threat to the local avifauna. The next winter (1985-86), there seemed to be even fewer ticks, with only a Rufous-sided Towhee and a Purple Finch showing parasites, and the winter of 1986-87 was similar with just one Northern Cardinal and two Purple Finches carrying ticks. In strong contrast, since 1987-88 ectoparasites have increased drastically, and if the past winter of 1990-91 is typical of what's to come, ticks soon may be infesting Carolina birds in epidemic proportions. Of 345 Purple Finches I banded in 1991 from January through March, 41 of them were tick-infested--almost as many in one winter as the 49 I caught with ticks in all the years from 1982-90! Albert Conway, a fellow bander who has studied birds for more than 50 years, sees a similar increase in ticks on birds he bands at Catawba, SC. Conway's grassy property is more open than mine and he gets more Dark-eyed Juncos. In 1987-88, 13 of his 51 juncos had ticks--an incredible 25% infestation rate for the species. Arachnologists--specialists who study spiders, mites, ticks, and their kin--have described several species of avian ticks. Some appear to infest only birds, while others spend parts of their lives on small mammals such as rodents and rabbits. One apparently bird-specific tick (Ixodes brunneus) was reported by the late Charlie Blake from 11 kinds of birds he banded near Durham, NC. I suspect it is this species that shows up most often on my birds at York. A few local birds, however, have borne the deer tick--a species known to cause Lyme disease, or "tick arthritis." I've caught several Purple Finches with up to four ticks, but the record-holder was infested by a grand total of eight--all swelled to more than 3mm in diameter. Several ornithologists and parasitologists I've talked with are undecided about whether these ticks transmit diseases from one bird to another, but just the blood loss caused by eight ectoparasites around a bird's eyes and brain probably can disrupt normal activities. When I first captured that eight-tick purple finch, I removed all the ticks and preserved them in alcohol. I also banded the bird, noted that both sets of eyelids were swollen nearly shut, and released the finch with little hope of seeing it again. I was pleasantly surprised when this particular bird hopped into my traps two weeks later. On close examination, I found no new ticks, and the fact that the bird's eyelids were in perfect shape was all the rationale I needed to continue plucking parasites from every bird I catch. Those few birds I caught with deer ticks bring up a whole new topic to ponder: Whether birds are responsible for the outburst of Lyme disease cases around the country. Lyme disease, named for the Connecticut town where it was discovered in 1975, is a baffling ailment apparently caused by a spirochete--a small, convoluted bacterium that hides out in the nervous system of its host. In the eastern U.S., the deer tick (Ixodes dammini) is a primary carrier of the spirochete, while in California and some other West Coast states the Western black-legged tick (Ixodes pacificus) is the only species known to transmit Lyme disease. Both these ticks are quite tiny; immatures are only the size of the period at the end of this sentence, while adults are slightly smaller than a capital letter "O". By comparison, dog ticks engorge to more than half an inch in length, and most ticks I find on my banded birds are about a quarter-inch long. Since I don't examine every captured bird with a magnifier, it's possible that I've missed finding tiny ticks on some individuals and that an even higher percentage of local birds are infested. Historically, deer and small rodents were the main hosts of the deer tick, whose complex life cycle takes two years to complete. Upon finding a mate and taking a blood meal from a deer, dog, or human, the adult female tick drops to the ground and lays her eggs in damp soil. Eggs hatch into tiny larvae that await a smaller host such as a mouse or bird. The next spring, the larvae metamorphose into nymphs and seek a new host, usually a mouse but occasionally a human. After sucking blood and molting through several nymphal stages, the immature ticks become adults that lie in wait for an unsuspecting passerby, and the cycle begins anew. Whenever a deer tick bites--either as nymph or adult--its saliva can pick up the spirochete or transfer it into the system of the host, sometimes resulting in Lyme disease. I'm particularly interested in deer tick life cycles and the epidemiology of Lyme disease because I happen to be a victim. Sometime in 1983--either in Minnesota where I was doing summer graduate work or shortly after I moved back to South Carolina--I apparently got a tick bite that left me with a large bull's-eye red rash on my lower left leg. At the time, local doctors and even two specialists at a medical university didn't know what to make of the rash--"maybe it's really from a spider"-- and it went untreated. Within a year, however, I had severe joint pain in both my knees, ran high fevers almost nightly, became lethargic, and developed an irregular heartbeat--all possible symptoms of this perplexing ailment. By then the story of Lyme disease had hit the medical literature and the popular media, and a new set of doctors diagnosed my condition as "tick arthritis." Lyme disease often affects different people in very different ways. Some victims never get a rash, most have severe headaches, others have heart scarring and partial paralysis of their limbs, many develop arthritic deposits, and some who go untreated may suffer severe nervous system damage that can cause death. In the past, the diverse symptoms of Lyme disease probably led doctors to misdiagnose it as a variety of other ailments. In its earliest stages, Lyme disease is most easily treated by injections of high-powered drugs, and there's evidence that massive doses of antibiotics given several years after the tick bite will destroy spirochetes that have been wandering around causing damage inside the host. In the spring of 1990--almost eight years past my suspected tick bite--I had four shots per day (two in each hip) to try to kill the disease. After a few days of playing dart board for the nurse and her "horse syringe," I could hardly walk, but I did get some remission of symptoms. Now, at least, my arms don't go to sleep several times every 24 hours, and I have enough energy to walk around Hilton Pond without having to rest along the way. It's entirely possible that a deer tick jumped from a bird to me during banding, but I think it's more likely that a nymph or adult tick simply hitched a ride on my pants leg as I passed through its habitat. In the old days, about the only way to encounter a deer tick was to go into woods where deer lived, but now it appears that migratory birds, transplanted deer herds, and hunting dogs that travel the country with their owners can transport deer ticks and spirochetes to places where they had been absent or uncommon. And so, there's good news and bad news. The bad news is that in some sections of the country--perhaps because of migrant birds--you can probably pick up deer ticks right in your own backyard, but the good news is twofold: You can guard against these ticks, and Lyme disease symptoms are now familiar to physicians who can treat the ailment before permanent problems occur. Deer ticks are most likely to bite people from May through August and occur most commonly in deciduous woods, grassy areas, and abandoned old fields--all locations that are loved by birdwatchers. To guard against ticks in these habitats, wear long sleeves with elastic cuffs and tuck your trousers into your socks. Ticks show up more easily on light-colored clothing and can be collected with tweezers or a piece of cellophane tape. As a precaution in areas with known deer tick infestations, experienced field workers use insect repellents with high concentrations of DEET, a powerful compound that is probably best sprayed on socks, trousers, and sleeves rather than on bare skin. A commercial product called "Repel" is 52.25% DEET and comes in a non-aerosol pump container, but there are several other brands that you may want to experiment with. If all these preventive measures fail and you get bitten, remove the tick with tweezers, sterilize the tiny wound, and save the tick in alcohol. If there's any suspicion of Lyme disease, your doctor can have the tick analyzed and may draw your blood for testing. The blood tests are not 100% accurate, however, so if physician suspects false test results, a spinal tap may be required to confirm the presence of spirochetes that often hang out in spinal fluid. The last thing I want to do is make anyone paranoid about going out to enjoy birds in natural habitats. Even in areas of the country where Lyme disease is most prevalent--primarily New England, Minnesota, and California--birders ought not sit indoors fretting about their chances of contracting the ailment. Armed with a little DEET and knowledge about how to recognize and remove deer ticks, there's no reason why you can't venture out at any time of the year to pursue yet another new bird for your life list. After all, birds and ticks and spirochetes and humans are part of our world, and together they make for a fascinating story that's worth learning about and re-telling. For further information and brochures about Lyme disease, or for the name of a support group near you, contact The Lyme Disease Foundation, PO Box 332, Tolland, CT 06084; (203)871-2900. Bill Hilton Jr. is a science education consultant, writer, naturalist, and Macintosh computer enthusiast who lives in York, South Carolina. This is his first article for WildBird magazine.